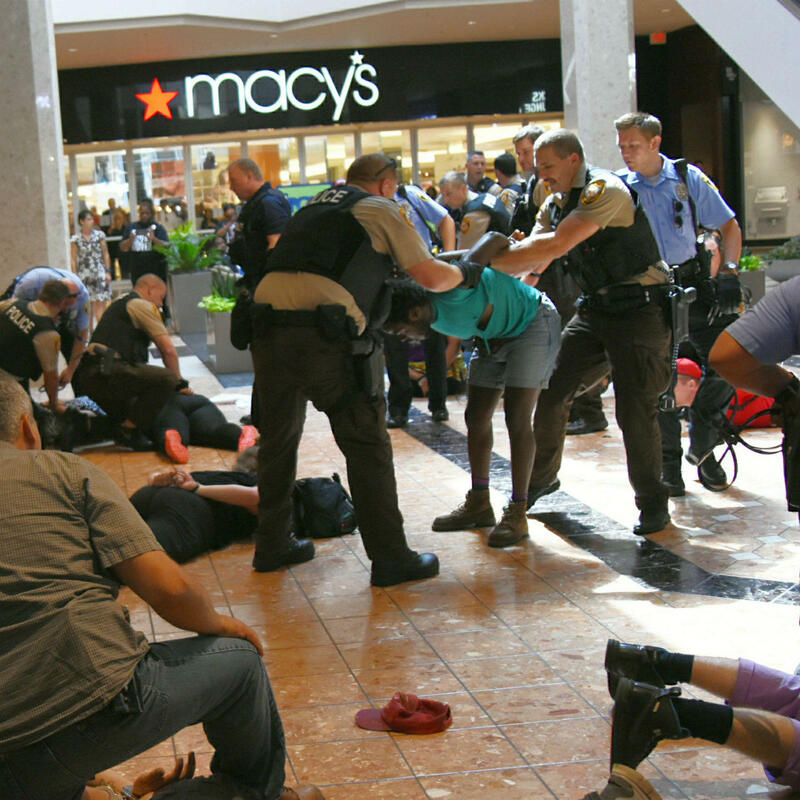 St. Louis County police arrested at least 22 people Saturday during a protest at the Galleria mall. But not long after the protest began, Richmond Heights police ordered the protesters to leave. According to police, someone threw a garbage can near the bottom of an escalator and protesters blocked the escalator. Richmond Heights officers called St. Louis County police for assistance, and after they arrived officers tackled at least two people. Later in the evening, a crowd of about 150 people gathered outside the Buzz Westfall Justice Center in Clayton to wait for the 22 people to be released. Many in the crowd were angry at what they considered excessive force by police officers who made the arrests. Morgan Patterson Gill, 22, was among them. She had gone to the Galleria to get something to eat, and saw police make some of the arrests. “It was an absolutely overreaction,” Gill said. She said she saw officers arrest a woman who was simply going to work at the mall because the woman walked by police lines. Gill also said a police officer threatened and pushed her. Gill said police did not tell those they took into custody why they were being arrested. A spokesman for the St. Louis County police said officers on scene gave plenty of warning before moving in and making arrests. Ian Barczewski, 29 ,was at the jail to find out what happened to his friend, 35-year-old Zach Becker. Becker was at the mall shopping for a suitcase when police arrested him, Barczewski said. Barczewski and other friends were trying to get medication to Becker, who recently had a kidney transplant. 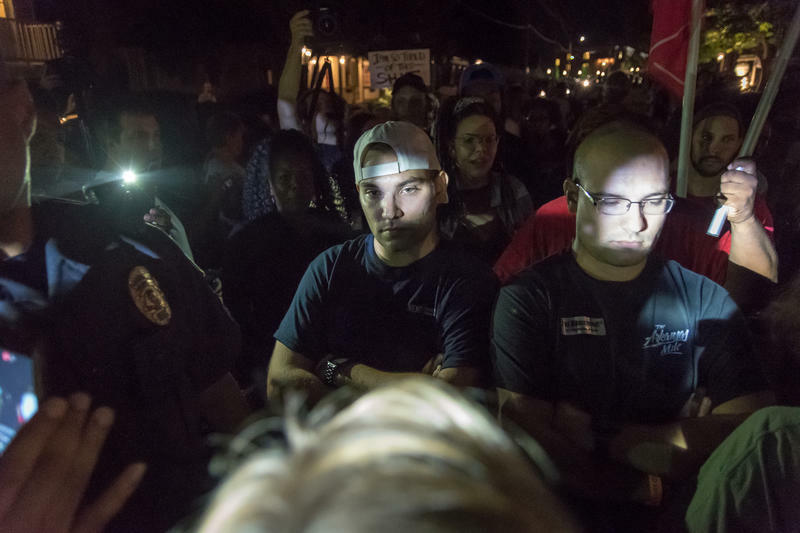 After police shut down a protest in the Galleria mall and arrested 22 people, demonstrators went to the Buzz Westfall Justice Center in Clayton and later to the Target in the Brentwood Promenade. In its letter, the ACLU said the images of Saturday’s arrests appeared to show unnecessary use of force such as officers tackling people and arresting them in ways that could cause injuries. Lawyers who came to the county jail said authorities denied them access to clients arrested at the Galleria. The lawyers wanted to speak with clients to make sure they were safe, did not need medical attention and were processed properly. It’s unusual for lawyers to be denied access to both their clients and a judge, attorney Sarah Molina said. Attorneys on the scene also said they were unable to get medication to clients or inform nurses in the building what prescriptions were needed. Some protesters left the county jail to march two blocks to the Ritz-Carlton St. Louis in Clayton, one of the region’s most expensive hotels. Police in helmets and carrying shields and batons blocked them from entering the hotel, and the crowd returned to the jail after about 20 minutes. 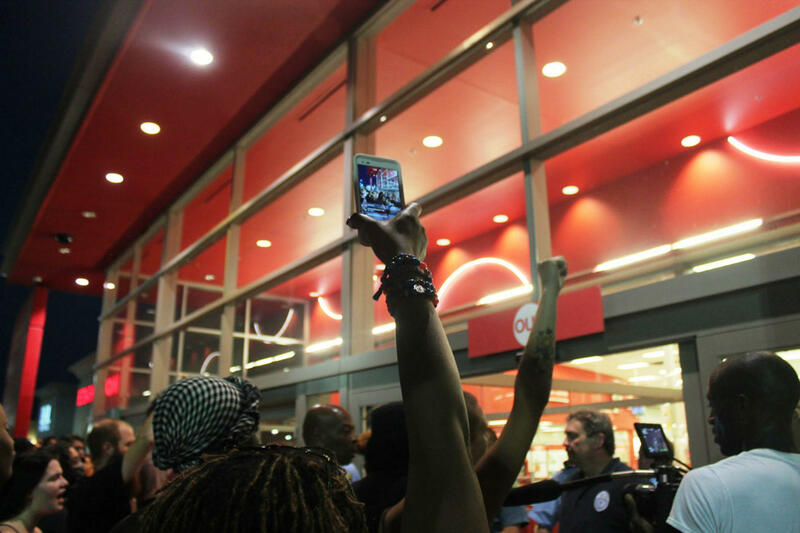 The group later reconvened at the Brentwood Promenade, where they blocked the entrance to Target. Police from a number of area departments kept them from entering the store, and employees could be seen locking the doors from the inside, only letting out shoppers to get to their cars. A group later stood in the street, but dispersed when ordered to by police. A protest at the Galleria mall in Richmond Heights ended in at least 22 arrests Saturday afternoon, eight days after former St. Louis police officer Jason Stockley was found not guilty of murder. Despite a heavy police presence, demonstrators, including families with young children in strollers, entered the mall without opposition, chanting “No justice! No profits!” and circling the main level as shoppers looked on from upper floors. But chants gave way to running and shouting as at least two protesters were tackled to the ground and arrested. The St. Louis County Police Department says approximately 150 obeyed officers' order to leave, but police arrested 22 people when they didn't leave the mall. The department said via Twitter that officers ordered protesters to leave after "destructive actions." Stockley, who is white, was found not guilty of first-degree murder last Friday after an August bench trial in the 2011 shooting of Anthony Lamar Smith, who was black. Prosecutors alleged Stockley executed Smith after a car chase and then planted a gun in his car. Stockley maintained that Smith, a suspected drug dealer, reached for the gun and that he shot Smith in self-defense. 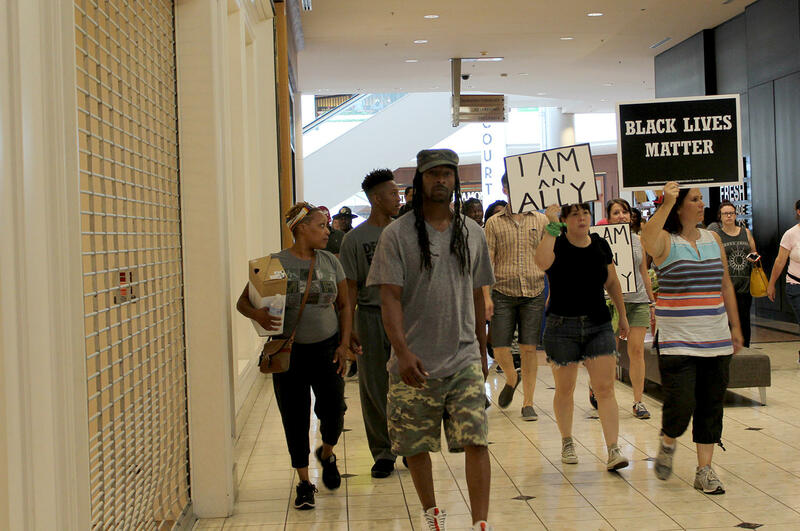 Saturday's protest followed one at the St. Louis Galleria on Wednesday, after organizers first announced they were headed to Clayton. 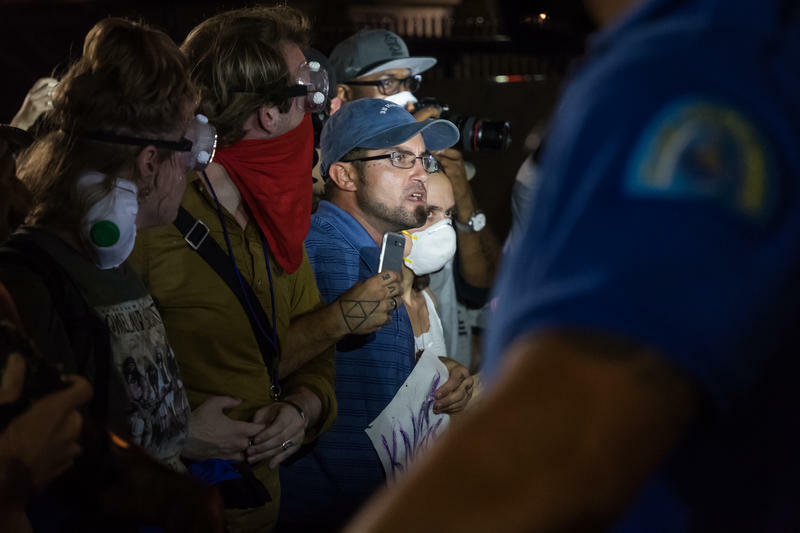 Demonstrators chant "No Justice, No Profit" at St. Louis Galleria Saturday before police ordered them to disperse. Police said they later arrested 22 people. Afua Bromley said she came to the Galleria protest because she wanted to be with others who are taking a stand against systemic oppression. Bromley, a former teacher who has lived in St. Louis for 17 years, said the region’s biggest problem is the “legacy of racism” and the refusal of people to acknowledge longstanding discrimination in housing, education and employment. "Even the question of ‘where did you go to high school’ has all this under — this tone of did you go to a black school, or a white school — and how that colors peoples’ perceptions of who you are and what kind of family you came from,” she said. “I have a 15-year-old son, and as an African-American mother, I fear every day when my son leaves the house,” Bromley said. “It’s not just about the verdict." Amanda Verbeck of St. Louis, who is white, came to the demonstration with a sign quoting the late South African anti-apartheid activist and Anglican bishop Desmond Tutu: “If you are neutral in situations of injustice you have chosen the side of the oppressor.” She said people in St. Louis need to speak against racism. On Saturday, protesters entered the mall by the Cheesecake Factory and were watched closely by mall security and police. Their chants of “Shut it down!” echoed through the mall as they passed closed stores. Police guarded escalators to prevent demonstrators from moving the protest to other floors of the mall, but otherwise stayed back at first. But a police presence grew after several protesters pushed past an officer to climb an escalator. One protester picked up a trash can blocking the escalator and tossed it aside. No one has the right to destroy the property of others and remain on private property after being asked to leave. The demonstrators who made it to to the balcony above, chanted and marched to another escalator, where they traveled back down to join the rest of the protesters. Soon after the police ordered them to disperse, they began to move towards an exit. One officer shoved a man back who tried to go another direction. Demonstrators then began running towards the doors as police moved towards them, making the arrests. After the mall protest ended, demonstrators went to the St. Louis County Justice Center in Clayton, to call for the release of those police arrested. Earlier Saturday, about 100 people protested the Stockley verdict outside America's Center in downtown St. Louis.